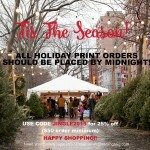 Last call for photo prints that are guaranteed for Christmas! Orders must be placed by midnight on Friday, December 4th! Happy shopping! !